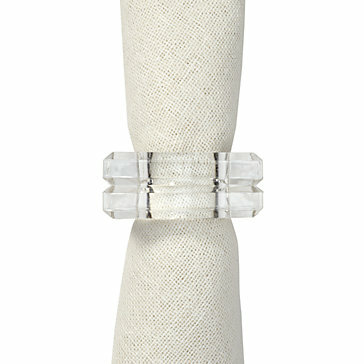 Simply square, these acrylic napkin rings will add a unique angle to your table setting. A clean slit carves out an interesting dimension for these clear, durable napkin rings. [value] => I was a little skeptical of these before I ordered, after I received them I was thrilled, they are so beautiful. I'm reordering more!!! [value] => just what I've been looking for! [value] => I have found it very difficult to find simple, but elegant lucite napkin rings, and these are perfect - well made, go with any decor, beautiful. [value] => Perfect gift, looks clean and modern. I use mine all year round. [value] => I love these napkin rings. They go with everything. I was a little skeptical of these before I ordered, after I received them I was thrilled, they are so beautiful. I'm reordering more!!! I have found it very difficult to find simple, but elegant lucite napkin rings, and these are perfect - well made, go with any decor, beautiful. Perfect gift, looks clean and modern. I use mine all year round. I love these napkin rings. They go with everything.